Mimaropa is a region of Luzon, but it is not on Luzon? Mimaropa Region stretches from Batangas in the north to almost Borneo in the south! Mimaropa Region 4B, is a region of the island group Luzon. However it’s provinces are not on the island of Luzon. The region starts to the south of Batangas and extends to nearly Borneo. Mimaropa region use to be part of the Southern Tagalog Region 4 which was split in two in 2002. The two new regions formed are Calabarzon, which is on the island of Luzon, and Mimaropa, which is why it is part of the island group of Luzon. 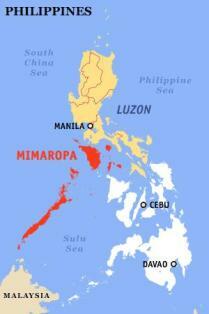 Mimaropa is composed of five provinces. Marinduque is a delightful little island which is just starting to take to tourism and this little island has a lot to offer. The possibilities are endless on this island. Activities like hiking, mountaineering, trekking and caving have fantastic promise on the island and that does not include under the water of the island. This is rich in diverse marine life and for the avid scuba diver absolute heaven. What more could you ask for, underwater caverns, wrecks, great drift diving, fantastic walls with soft corals. What this little island province is most famous for is it’s Moriones Festival during Holy Week. The festival centres around a play in which a Roman soldier called Longinus, who is totally blind in one eye. As he thrusts his spear into the right hand side of the crucified Jesus, some of Jesus’ blood is dripped onto Longinus’s blind eye. As he wipes the blood from his face he realises that he can see with both eyes and he witnesses Jesus ascending to heaven. The Romans not wanting this to become common knowledge track down Longinus and capture him with the climax on Easter Sunday being the beheading of Longinus. Marinduque lies almost smack bang in the centre of the Philippines archipelago. It is south and west of the main island Luzon and east of Mindoro, to the south is the island of Romblon. Flights from Manila will get you to Boac or you can catch a ferry from Batangas, Manila, Luzon or Mindoro depending on where you are. Occidental Mindoro has lush rainforests, waterfalls, beautiful white sand beaches, spectacular diving which is rich in marine life and numerous islands to explore. The inland is rugged and basic but of you would like to meet with the elusive wild Tamaraws or visit a Mangyan settlement then this adventure is for you. The coastline is littered with small coves and islands with white sandy beaches, there are a few resorts that will cater to the tourist especially those interested in marine activities like scuba diving and snorkelling. One of the major underwater drawing cards to Occidental Mindoro is Apo Reef, this has been rated as one of the best dive spots in the Philippines and is not to be missed, thankfully it is a National Park. This province is bounded on the north by the Verde Island Passage which separates Luzon from Mindoro. The province of Oriental Mindoro is to the east and is separated by the Halcon Mountain Range running the entire length of the island. To the west and south is the Mindoro Strait. Oriental Mindoro occupies the eastern side of the island of Mindoro. It has an extremely rich marine life with startling coral life, wrecks, drop offs and drift diving. The most popular area for accessing the marine life either as an experienced or beginner scuba diver is the popular tourist town of Puerto Galera. The beaches around the coves and islands are spectacular and are a major tourist draw card being less than a day trip from Manila. Don’t miss a trip to Tamaraw Falls, the highest in the province at 131 metres. Other activities frequented by tourists include mountain climbing, game fishing, kayaking, hiking and golf. Access to Oriental Mindoro from Manila will take you about two to three hours by road to batangas and then an hour by ferry from Batangas to Puerto Galera or two and half hours to Calapan. Oriental Mindoro is bordered to the north by the Verde Island Passage, to the east the Tablas Strait and Romblon and to the south by Semirara Island near Pandarodan Bay and shares the Halcon Mountain ranges as its western border with Occidental Mindoro. Palawan is the largest province in the Philippines, it has an amazing 1,768 islands spread over more than 1.5 million hectares. It is known as the green island in relation to it being eco friendly as it has been declared a nature sanctuary of the world. Palawan has it all, from lush tropical rainforests, rugged mountains reaching into the ocean to white sand beaches and hundreds and hundreds of islands. One of the more popular tourist areas is El Nido where you can visit all terrain in a small area, the marine life is stunning the crystal clear water lapping against the pure white sand is breathtaking, not to be missed. The entire scenery is unforgettable. The capital, Puerto Princesa is the gateway for most air travel and will take approximately 55 minutes from Manila, there are other towns that the domestic airlines will take you to as well. Palawan lies to the south of the island of Mindoro and is the most westerly point of the Philippines. To the south lies the island of Borneo, the west is the South China Sea and to the east is the Sulu Sea. Romblon Province is a collection of 20 islands with three largest, Tablas, Romblon and Sibuyan. It is well known for its high grade marble deposits which have established this province on the world market. It has been said that the marble of Romblon is as high a quality as that of Italy! Big statement. The natural beauty of the islands is awe inspiring, with deserted beaches and rich marine life. There are also historical landmarks such as Spanish Forts and places for tourists like waterfalls and jungle treks. The collection of islands is bordered to the north by Marinduque, to the south by the island of Panay to the west by Mindoro and to the east by Masbate. A couple of flights a week from Manila to Romblon occur, the more frequented travel option is by ferry, mainly from Batangas.